Last year, one of the coolest events Nick held was an awesome coffee taste test. We blind-tasted 12 different coffees from local roasters and everyone filled out a tasting sheet. 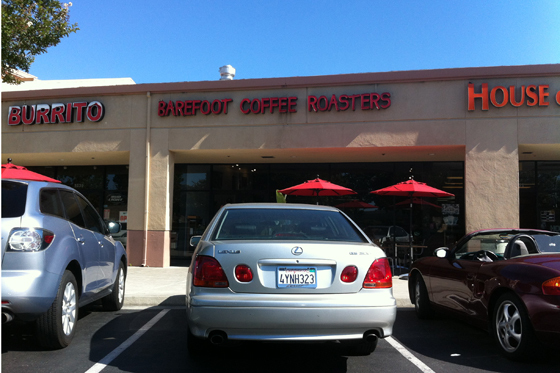 When all the data was collected and tallied, the overall favorite was Barefoot Coffee in San Jose. Last night we visited Ryan and stayed overnight (and last night, I ate a grasshopper, by the way – ha!). Today, we decided to pay a visit to the original Barefoot Coffee Roasters shop for our morning cup of Joe. 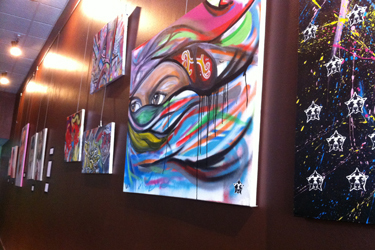 The place is a little unassuming spot in a strip mall. If you didn’t know what you were looking for, you could easily miss it. Luckily Ryan knew exactly where we were going. 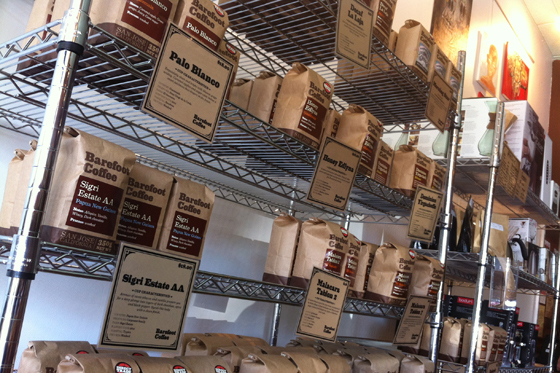 Inside the store, there’s a rack with a wide variety of different roasts for sale, as well as another rack full of coffee makers, other coffee products, and even Barefoot Coffee Roasters t-shirts. 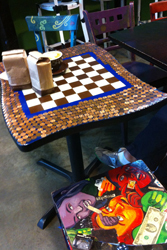 There’s cool art on the walls, and even our table and chairs looked like a work of art with fantastically colorful paintings – and a chess/checker board table, too! Awesome. 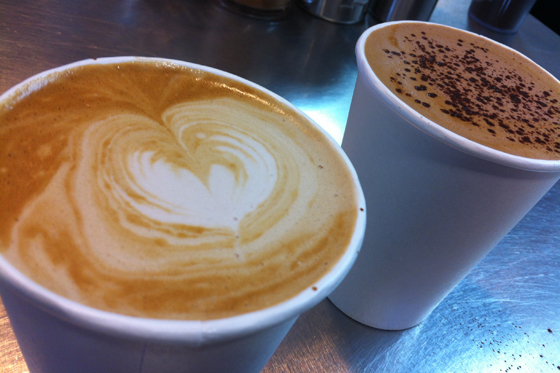 Their menu has some great, creative espresso drinks in addition to the basic lattes and cappuccinos. Nick ordered a “Mocha Borgia,” a mocha made with fresh orange zest and dark chocolate, and I got a “Voodoo” – “a sweet concoction of dark chocolate, coconut milk and muscovado sugar over espresso. The drinks were delicious. 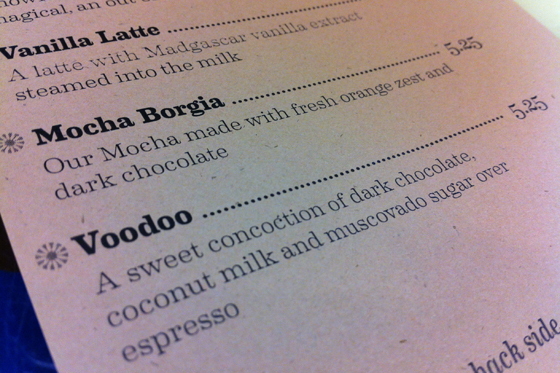 The coconut milk in my Voodoo was just heavenly – fantastic, rich nuttiness and depth of flavor – and the chocolate added a nice layer of character. It was just a tad sweet for me, with the dark chocolate and added sugar, so next time we’re there I’d want to try the same drink without the extra sugar, but it was still super good. Seriously the best part of waking up.